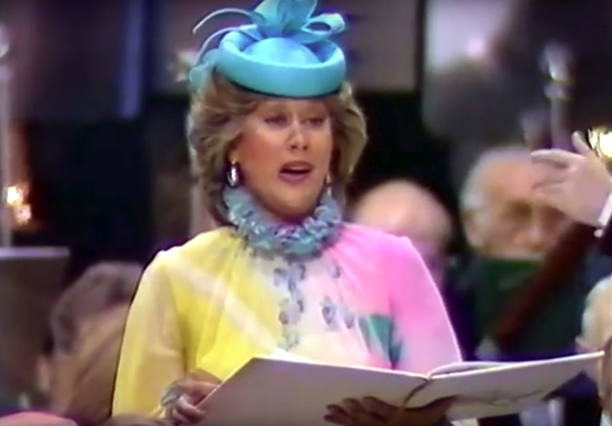 For six minutes New Zealand opera star Kiri Te Kanawa took centre stage at the highly anticipated wedding of Prince Charles to Lady Diana Spencer at St Paul’s Cathedral, London. In front of royalty, heads of state and distinguished guests, and a television audience of over 600 million, Te Kanawa sang ‘Let the bright Seraphim’ from Handel’s Samson while the bride and groom signed the register. A triumphant piece, it calls on the bright Seraphim (angelic beings), to blow their trumpets and Te Kanawa was accompanied by trumpeter John Wallace, along with a choir and orchestra. Te Kanawa had previously met Prince Charles and sung for members of the royal family aboard the Royal Yacht Britannia, but she later admitted that when she first got the call asking her to sing at the wedding she wondered if someone was playing a trick on her. Once she realised the request was genuine, she then had to keep it secret for a number of months leading up to the big day – even while shopping for an outfit. Te Kanawa had understood that only her head and shoulders would be visible so felt she should choose something as colourful as possible. The brightly coloured, flowing dress with a ruffled neck, accompanied by a small blue hat, raised some eyebrows; one journalist described the outfit as a ‘multi-coloured tablecloth and air hostess’s hat’. But Prince Charles reportedly admired the ‘stunning combination of colours’ and likened it to a ‘wonderful canary’. The following year Te Kanawa was appointed a Dame Commander of the Order of the British Empire (DBE) for services to opera by Queen Elizabeth II. In 2015 Prince Charles presented her with an Honorary Doctorate from the Royal College of Music. We have 17 biographies, 10 articles, related to Kiri Te Kanawa sings at Royal Wedding.